We use a fun format, with daily prizes (net and gross) for amateurs, professionals and teams. Overall tournament winners are based on best 2 out of 3 rounds. Green fees and shared (1/2) electric golf cart for 3 rounds of golf. Welcome cocktails and dinner on evening of January 16. Breakfast on mornings of January 18, 20 and 21. Awards cocktails and dinner on last evening, January 22. 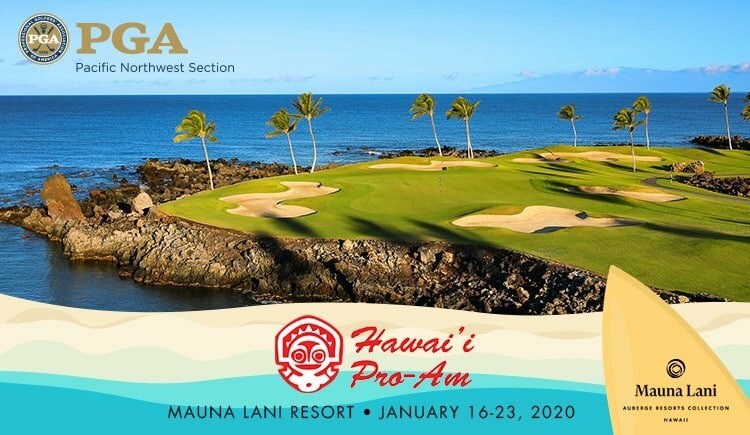 The Hawai’i Winter Pro-Am began in 1976 and has taken place every year since then. Over the years, many beautiful courses have hosted this tournament including Wailea GC, Waikoloa, Kaaanapali, Poipu Bay GC and Mauna Lani.